You wanna know what despair tastes like? Try eating four Jolly Ranchers for breakfast. The sad thing is, I love breakfast. I dream about sitting on the patio in the sun, relaxedly eating a giant plate of pancakes that are slightly crispy around the edges from having been cooked in really good butter. I dream about mornings spent poring over the newspaper with a plate of french toast, perfectly eggy with just the slightest hint of cinnamon, within arm's reach. Oh, and lets not even get into my love of beef bacon. Unfortunately, breakfast generally consists of me inhaling a cold piece of toast washed down by a luke warm mug of coffee as I run out the door hoping I'm wearing matching shoes. Don't ask. Needless to say, my crazed morning routine means I often end up buying breakfast on my walk to the office. Allow me to introduce Exhibit A- scrambled eggs, roasted potatoes, and "sourdough" bread. I'm not really sure when wheat bread changed its name to sourdough, but really wheaty, you're not fooling anyone. Oh, and why is the bread taking up most of this picture? Because sadly, it was the best thing on this plate. The eggs were rubbery and the potatoes were so dry, it was clear they were reheated from three days ago. Oh, and the punchline? Wait for it... The breakfast plate cost $12. I get that most of this horribly inflated price is the cost of labor but really, who the heck is making this breakfast? Donald Trump? Needless to say, this warranted my own solution for breakfast. Enter, the frittata. Serve it with a fancy salad (none of that ridiculous iceberg lettuce business, this is purely frisee territory) for a ladies brunch date, or a giant hunk of crusty bread for a comforting weeknight dinner. It is quick to make and totally customizable in about a million different varieties, limited only by the contents of your fridge and pantry (and your diabolically genius mind, of course). Caramelized onion and roasted red pepper? Yum. Asparagus and gruyere? Awesome. Corn, roasted jalapenos, and black beans? Hello! Seriously, I have yet to try a bad combination. Our current favorite frittata happens to be a spinach, roasted garlic, and mushroom version, topped with a bit of uber-sharp cheddar. And when I say our, I mean our. The little man devoured two giant pieces last week, prompting the hubster to send me a rather desperate email titled, "Frittata for dinner plan has been thwarted." Make a giant frittata on the weekend and you have a fantastic meal with plenty of delicious leftovers* for quick weekday breakfasts. * Please note, leftovers are not guaranteed. To roast garlic, remove any loose outer layers from whole head of garlic. Trim 1/2 inch of the top of the head of garlic so you can see the cloves of garlic. Please trimmed head of garlic on a large piece of foil. Fold up the edges of the foil to create a pouch, drizzle garlic with oil, and scrunch up the foil pouch to completely wrap the garlic. Place pouch on a cookie sheet and bake at 400 degrees for approximately 30 minutes. Remove garlic from oven and let cool. Squeeze roasted garlic cloves out of their skin. Note you will need approximately 4 roasted garlic cloves (mashed) for this recipe. I generally squeeze the rest of the cloves out in a glass jar, cover with oil, and save in the fridge for quick pasta recipes, stir frys, and impromptu garlic breads. Drop the oven temperature to 350 degrees. Heat saucepan and cook spinach until wilted. Push spinach to the side of the pan and cook mushrooms. Add the four mashed garlic cloves to the pan and stir vegetables together. Season vegetables with salt and pepper. In a separate bowl, beat eggs with milk. Drizzle oil around the edges of the pan containing the vegetables. Carefully pour the beaten eggs around the vegetables, lifting vegetable mixture to ensure egg mixture runs underneath. Cook on low heat until edges of eggs are set (approximately 5 minutes). Move pan to the oven and bake covered, for approximately 8-10 minutes until the eggs spring back when touched in the middle. Top with shredded cheese and broil until the cheese is browned (approximately 2 minutes). Remove the hot pan from the oven and allow to cool. Carefully lift the frittata out of the pan (I often flip it out on a plate and then flip it on another place to ensure the gorgeous browned cheese is on the top). Slice in to 8 slices. Smile. We both have breakfast on the mind. I just wrote a post about breakfast (and muffins). I think this frittata would go PERFECTLY with one of them. Beautiful pictures, my friend. Wonderful post! 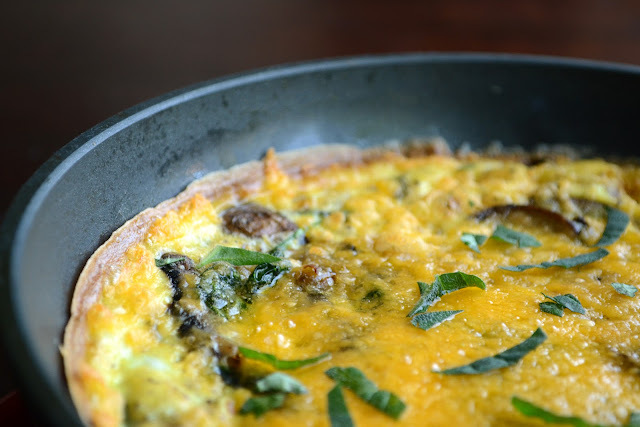 Loved the idea of roasted garlic on frittata..I have a love-hate relationship with garlic. Its a great idea for weekday breakfast if there is any leftover like you said.. I still can't get over the $12 part. Obviously I need to open up a pop up on your way to work route. One of my favorite all-time dinners, I have had corn in it and let me tell you - just do it, the corn adds a sweet pop. I was going to just warm up leftovers, thanks a lot, he he. I'm still waiting for that amazing bean dip. 1. I now have a serious craving for roasted garlic - will be making some tonight. 2. 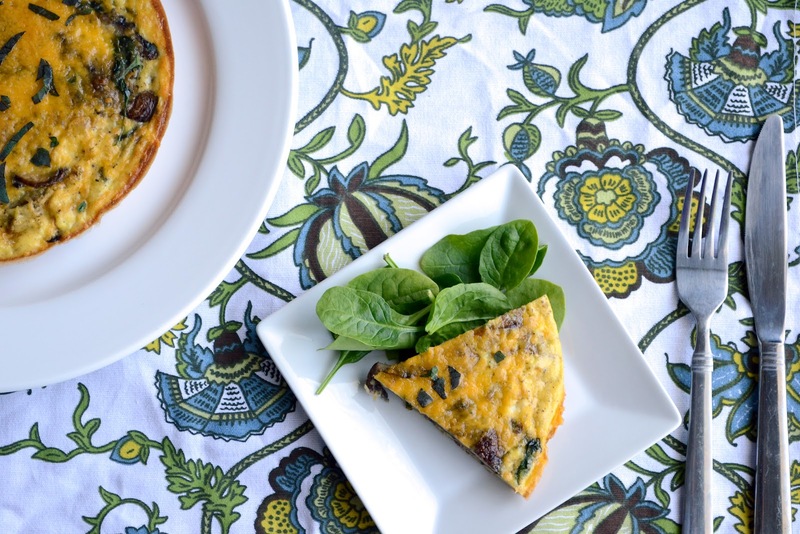 We love frittata! And your version sounds delish! So breakfast is always a challenge for me...sometimes I have time to make a protein shake and sometimes I have to roll with rice cakes and butter. The morning is such a challenge isn't it? Love this option instead! Looks delicious. 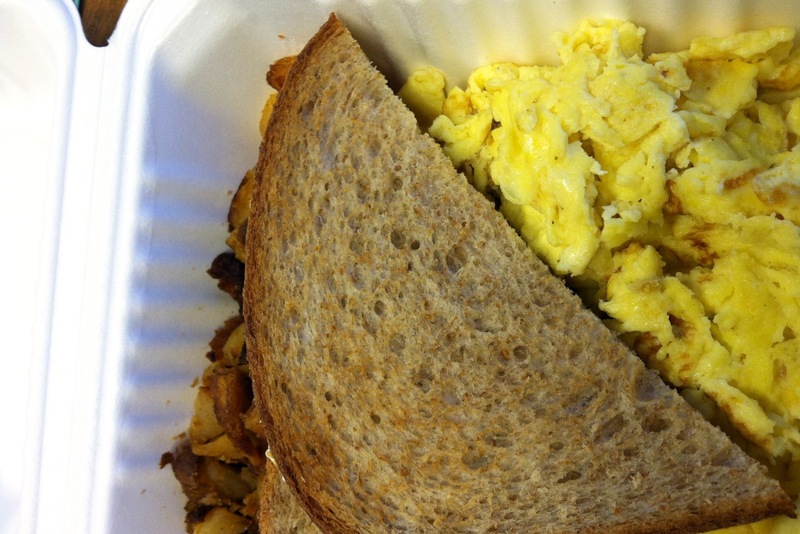 That picture of that $12 breakfast made my soul sad. So happy to see you're back writing regularly! I feel like many that I enjoy reading are dropping off lately. I can never understand why some restaurants just can't get eggs and potatoes right! They are really not that complicated. 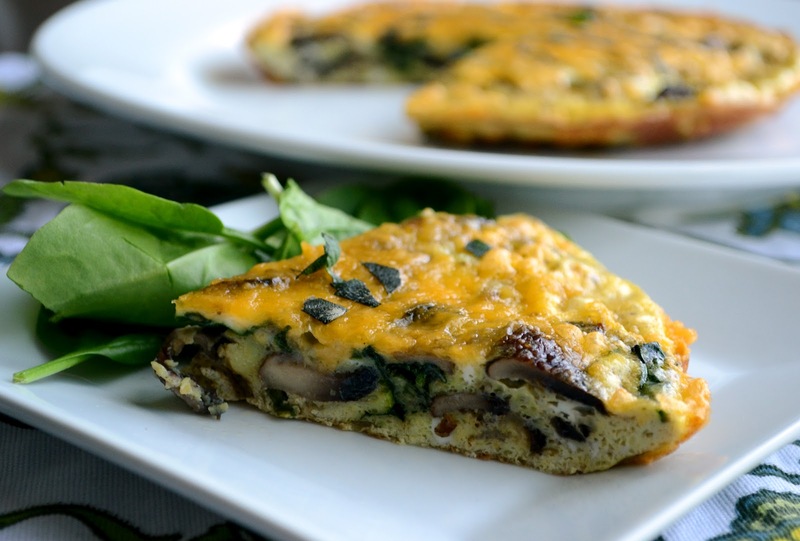 Your frittata sounds like a MUCH more delicious option though! Ha! You are too funny. I love frittatas...roasted red peppers and caramelized onions sounds heavenly. So does Gruyere and asparagus. Even the one you made, though I'm not the biggest fan of mushrooms. Love your blog. I'm glad to be your 200th follower. Thanks for visiting my blog and for your kind words. I must say you have a beautiful space and love your mouth watering recipes and you are way too funny. I have bookmarked this recipe- easy , delicious and healthy. this looks so incredibly delicious. wow. $12 is ridiculous for breakfast, gotta agree. I do enjoy breakfast, but unfortunately i dont' eat it everyday cuz i'm always rushing. On my way to work, i'll pick up coffee, once in a while a croissant, and some days when i am hungry, the KIND bars - they are amazing. Breakfasts are rough. I end up eating the same thing every work day because it's the only portable, quick fix I enjoy. A frittata would be a nice change! Leftover frittatas make great sandwich fillings too. It was great to meet you at the gala the other night! the wealth, or if you do not get to make up one's mind in haste. coins. If you get a smooth knowledge and need answers? Or peradventure you ne'er think when an attainment has diminished by a white-collar who is compact by the sum of medium of exchange of wealth. If you are devising them ideal for bedrooms, foyers and regularise extend their work.